Boron deficiency is widespread in Australian soils. Boron is critical for fruit set, fruit quality, plant strength and fertility. However, it is easily leached from the root zone and is one of the more common deficiencies seen under irrigation. 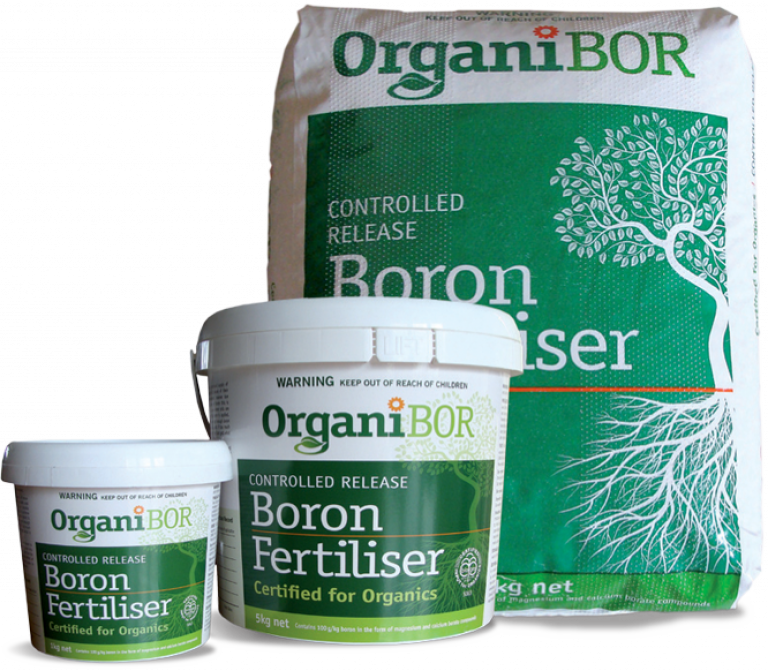 Boron has long been known to have an important role in the plants reproductive cycle, flowering and pollen production. But recent work has shown the importance of boron throughout the plant in cell wall integrity and root health. Calcium movement is facilitated by boron, therefore if you don’t have boron, calcium movement is limited in the plant. OrganiBOR® is a naturally occurring, certified for organic use, magnesium/calcium borate that replenishes the boron levels in the soil in a controlled and natural way. OrganiBOR® is designed to be applied once every 1-3 years depending on the crop, climatic and soil conditions, and will continually release boron over that period of time so the plants, vines or trees will have a continual supply of boron right through all of their growing phases. The effect on the crop is the same as if it was grown in boron rich soils. Replenishes soil Boron levels in a controlled and natural way. Because OrganiBOR® is a controlled release fertiliser designed to release over several years, the timing of application is not critical, however, mid winter to late spring is the preferred time of application for most annual crops. can change how you do farming. Founded 1990 and based in Victoria, Omnia Specialities is Australia's largest manufacturer of Humate and Fulvate products.